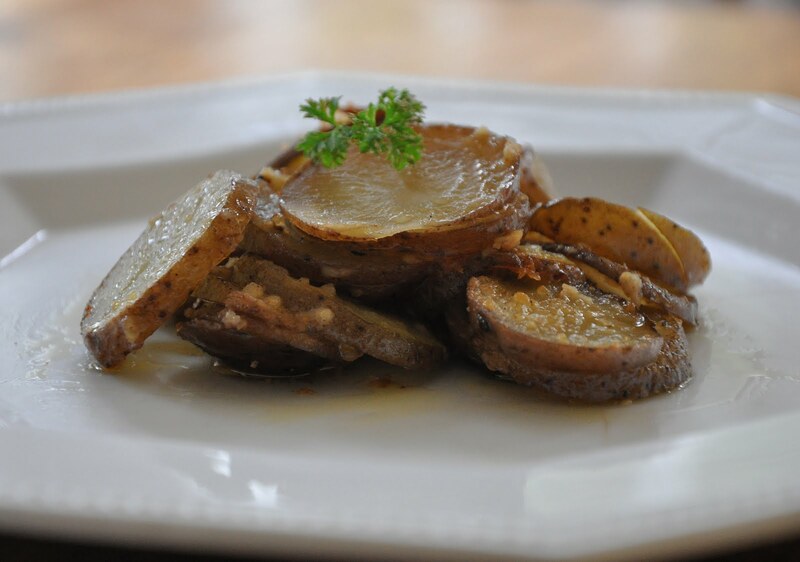 Living Lou: Kickin' Parmesan Roasted Potatoes .... Meatless Monday! Kickin' Parmesan Roasted Potatoes .... Meatless Monday! I've missed a few Meatless Monday's throughout my self imposed hiatus. It was a busy time with exams and such, which left me with basically no time for sleeping, let alone cooking!! So, unfortunately, and reluctantly, cooking was put on the back burner... but now that summer has officially started and I've had a little bit of time to recuperate it's time to try some fun new things in the summer!! To start us off, here's a fun little twist on the classic roasted potatoes that everyone loves! They are completely delicious and super easy! I like to add in a little cayenne just for a bit of bite, but you can add in as much as you please, or, can handle! Wash and thinly slice the potatoes (no peeling necessary!) Toss in a baking dish with the olive oil, sea salt and freshly cracked pepper. Next, to make your Parmesan mixture, mix together the remaining ingredients (cheese, mustard powder, cayenne and black pepper.) Throw the mixture into the dish with the potatoes and toss to coat. Place in the oven uncovered for 45 minutes. Once they are done, throw a bit of butter on top and serve.